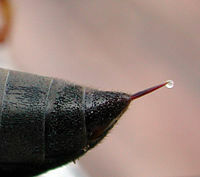 Wasp sting, with droplet of venom. Venom is any of a variety of toxins produced by certain animals (such as snakes, stingrays, spiders, and scorpions) for mechanical delivery (injection) into another organism, usually by a bite, sting, or spine, causing injury, illness, or death in the victim. Venom typically is used for the purpose of defense and predation, although some venoms may provide an additional digestive function. Venom is differentiated from the more generic term, poison, in that venom is necessarily produced by living cells and involves some delivery system or apparatus for introduction into the tissues and blood stream of another organism to cause its effect. Poison, on the other hand, is not necessarily produced by living cells and it may be absorbed by the body, such as through the skin or digestive system or even inhaled, rather than introduced by mechanical means by another organism. And poison tends to be widely distributed throughout the tissues of an animal, while venoms lack free distribution throughout the body and are produced, stored, and delivered by a very specific set of organs (Takacs 2001). Examples of venom delivery systems include injection through the hollow, hypodermic-like fangs of a rattlesnake or cobra, the barbed stinger of a honeybee, the thin, hollow spines in fins of lionfish, or the triggering of nematocysts by box jellyfish. The spitting cobras can shoot venom from the mouth and a hit to the eyes of the victim can cause temporary shock and blindness. Among animals widely known to use venom are snakes (such as elapids and vipers), lizards (such as the Gila monster), spiders, centipedes, scorpions, stinging insects (such as bees and wasps), fish (stingrays, scorpionfish, along with many others), jellyfish, mollusks (such as cone snails), and even some mammals (such as the male platypus or slow loris). A large number of venoms can disrupt the human nervous, cardiovascular, and muscular systems. However, despite the dangers that many venomous animals pose, venom also offers potential benefits. Research into snake venom has produced a number of potential stroke and cancer treatment drugs, and the venom of gila monsters offers promise for diabetes treatment (Handwek 2006). Among the attractions of venoms are their often staggering potency compared to plant compounds used for medicinal purposes and their often high specificity of action (Sprackland 2005). The terms poison, toxin, and venom are generally used in different senses. Poison is the most generic of the three terms. It refers to any substance that can result in infection, illness, injury, or death when ingested or brought into contact with the skin or bloodstream of a human being or an animal (Wilson 1993). A toxin is a chemical substance that is capable of causing injury, illness, infection, or death to an organism (poison) and that is produced by living cells or another organism. Toxin is specific for being produced by a living organism, while poison lacks this specificity. However, when used non-technically, the term toxin often is applied to any poisonous substance. Toxins are nearly always proteins that are capable of causing harm on contact or absorption with body tissues by interacting with biological macromolecules such as enzymes or cellular receptors. Toxins vary greatly in their severity, ranging from usually minor and acute (as in a bee sting) to almost immediately deadly as in botulinum toxin). Biotoxins vary greatly in purpose and mechanism, and they can be highly complex (the venom of the cone snail contains dozens of small proteins, each targeting a specific nerve channel or receptor), or a single, relatively small protein. Venoms usually are defined as toxins secreted by certain animals that utilize an apparatus or delivery system to inject them into another organism, such as delivered subcutaneously by a bite, sting, spine, or other means. While venom is occasionally, but rarely, used as a synonym of the more generic poison (Wilson 1993), in general there is a distinction made between "venomous organism" and "poisonous organism." Venomous, as stated above, refers to animals that deliver (often, inject) venom into their prey when hunting or as a defense mechanism. Poisonous, on the other hand, describes plants or animals that are harmful when consumed or touched (Wilson 1993). A poison also tends to be distributed over a large part of the body of the organism producing it, while venom is typically produced, stored, and delivered in organs specialized for this purpose and not distributed freely in other tissues (Takacs 2001). Poisonous animals lack localized or specific apparatuses for production, storage, or delivery of poisons, with the entire body, or a large part of it, poisonous (Takacs 2001). Plants can be poisonous, not venomous. Animals can be venomous, poisonous, or both venomous and poisonous. The slow loris, a primate, has poison-secreting patches on the inside of its elbows, which it is believed to smear on its young to prevent them from being eaten. However, it will also lick these patches, giving it a venomous bite. On the other hand, the hooded pitohui, a type of bird, is not venomous, but is poisonous, secreting a neurotoxin onto its skin and feathers. Most snakes are venomous, but poisonous snakes are also known to exist. Rhabdophis tigrinus, a colubrid snake common in Japan, sequesters toxins from the toads it eats then secretes them from nuchal glands to ward off predators (Hutchinson et al. 2007). The distinction between poison and venom can be seen in the fact that snake venoms are generally not dangerous when ingested, as long as there are no lacerations inside the mouth or digestive tract (Klauber 1997); thus, they are not called poisons. Venom is found among both vertebrates and invertebrates. Among vertebrates, perhaps the most widely known venomous animals are the snakes, some species of which inject venom into their prey through hollow fangs. Over 2,000 species are known to be venomous (Fry et al. 2006; Zimmer 2005; UM 2005). This number has recently increased greatly from a few hundred as research has revealed venom toxins in what previously were thought to be non-venomous snakes, and although these snakes have small quantities of venom and lack fangs, the venom still can be delivered via their sharp teeth (UM 2003). Although venom is found in several families of snakes, the two most well-known families of venomous snakes are Elapidae (including the cobras, mambas, and sea snakes) and Viperidae (vipers, such as rattlesnakes and puff adders). The gila monster and bearded lizard are two lizards that have venom and venom delivery system, although similar venom toxins now have been found more widely in lizards (Fry et al. 2006). Some believe venomous fish (not to be confused with poisonous fish) outnumber all other venomous vertebrates combined (Handwerk 2006). Venom can also be found in some cartilaginous fish (stingrays, sharks, and chimaeras) and in teleost fish, including monognathus eels, catfishes, stonefishes, scorpionfishes, lionfishes, gurnard perches, rabbitfishes, surgeonfishes, scats, stargazers, weevers, carangids, saber-toothed blenny, and toadfish. Although uncommon in mammals, two animals known to be venomous are the duck-billed platpus, which has a spur on the heel behind each leg, and the slow loris (Nycticebus), species of primates that can have a venomous bite from licking toxins produced from glands on the insides of the elbows. Some solenodons and shrews also are venomous. Among invertebrates, animals widely known to use venom are spiders and centipedes, which inject venom through fangs; and scorpions and stinging insects, which inject venom with a sting (which, in insects such as bees and wasps, is a modified egg-laying device—the ovipositor). Many caterpillars have defensive venom glands associated with specialized bristles on the body, known as urticating hairs, and can be lethal to humans (for example, that of the Lonomia moth). The stinging hairs or spines of caterpillars of some moths may be hollow and connected to poison glands, with the venom flowing on contact (Lyon 2000). Various ants and true bugs produce venom as well. Other invertebrates that produce venom include jellyfish and cone snails. The box jellyfish is widely considered the most venomous creature in the world. Nematocysts, a venomous secretory product, are the cnidarians' main form of offense or defense. They function by a chemical or physical trigger that causes the specialized cell to eject a barbed and poisoned hook that can stick into, ensnare, or entangle prey or predators, killing or at least paralyzing its victim. Snake venoms are complex mixtures of proteins and are stored in glands at the back of the head (Freiberg 1984, 123). Typically, these glands open through ducts into grooved or hollow teeth in the upper jaw (Mehrtens 1987, 243; Freiberg 1984, 5). These proteins can potentially be a mix of neurotoxins (which attack the nervous system), hemotoxins (which attack the circulatory system), cytotoxins, bungarotoxins, and many other toxins that affect the body in different ways (Frieberg 1984, 125). Almost all snake venom contains hyaluronidase, an enzyme that ensures rapid diffusion of the venom (Mehrtens 1987, 243). Venomous snakes that use hemotoxins usually have the fangs that secrete the venom in the front of their mouths, making it easier for them to inject the venom into their victims (Frieberg 1984, 125). Some snakes that use neurotoxins, such as the mangrove snake, have their fangs located in the back of their mouths, with the fangs curled backwards. This makes it both difficult for the snake to use its venom and for scientists to milk them (Frieberg 1984, 125). Vipers (Viperidae) have a single pair of long, hollow, venom-injecting fangs that can be folded back against the top of the mouth, tip inward, when the mouth is closed. Elapid snakes, however, such as cobras and kraits, are proteroglyphous, possessing hollow fangs that cannot be folded toward the roof of their mouths and cannot "stab" like a viper; they must actually bite the victim (Mehrtens 1987, 242). Snake bites cause a variety of symptoms including pain, swelling, tissue damage, low blood pressure, convulsions, and hemorrhaging (varying by species of snake). Doctors treat victims of a venomous bite with antivenin, which can be created by dosing an animal such as a sheep, horse, goat, or rabbit with a small amount of the targeted venom. The immune system of the subject animal responds to the dose, producing antibodies to the venom's active molecule; the antibodies can then be harvested from the animal's blood and applied to treat envenomation in others. This treatment can be used effectively only a limited number of times for a given person, however, as that person will ultimately develop antibodies to neutralize the foreign animal antibodies injected into him (anti-antibody antibodies). Even if that person does not suffer a serious allergic reaction to the antivenom, his own immune system can destroy the antivenin before the antivenin can destroy the venom. Though most people never require even one treatment of antivenin in their lifetime, let alone several, people who work with snakes or other venomous animals may. Fortunately, these people may develop antibodies of their own against the venom of whatever animals they handle, and thereby are protected without the assistance of exogenous antibodies. Farmer, S. 2004. Poisonous and venomous species of the Caribbean: Final paper. Miami University. Retrieved July 29, 2008. Fry, B.G., N. Vidal, J.A. Norman, F.J. Vonk, H. Scheib, R. Ramjan, and S. Kuruppu. 2006. Early evolution of the venom system in lizards and snakes. Nature (Letters) 439: 584-588. Retrieved July 27, 2008. Handwerk, B. 2006. Venomous fish far outnumber snakes, other vertebrates, study says. National Geographic News September 1, 2006. Retrieved July 29, 2008. Holland, J.S. 2008. Living color: Toxic nudibranchs—soft, seagoing slugs—produce a brilliant defense. National Geographic June 2008. Retrieved July 23, 2008. Hutchinson, D.A., A. Mori, A.H. Savitzky, G.M. Burghardt, X. Wu, J. Meinwald, and F.C. Schroeder. 2007. Dietary sequestration of defensive steroids in nuchal glands of the Asian snake Rhabdophis tigrinus. PNAS 104(7): 2265-2270. Retrieved July 29, 2008. Klauber, L.M. 1997. Rattlesnakes: Their Habitats, Life Histories, and Influence on Mankind, 2nd edition. Berkeley, CA: University of California Press. ISBN 0520210565. Lyon, W.F. 2000. Stinging hair caterpillars. Ohio State University Extension Fact Sheet. Retrieved July 29, 2008. Smith, L., and W.C. Wheeler. 2006. Venom evolution widespread in fishes: A phylogenetic road map for the bioprospecting of piscine venoms. Journal of Heredity 97(3): 206-217. Sprackland, R.G. 2005. Toxic treasure. Natural History Magazine October 2005. Retrieved July 29, 2008. Takacs, Z. 2001. The biology of venomous animals. Session 1. Venomous and poisonous creatures. Columbia University. Retrieved July 29, 2008. University of Melbourne (UM). 2003. Venom hunt finds "harmless" snakes a potential danger. ScienceDaily December 16, 2003. Retrieved July 27, 2008. Wilson, K.G. 1993. venom, poison (nn. ), poisonous, venomous (adjs.). Columbia Guide to Standard American English. Retrieved July 29, 2008.
Zimmer, C. 2005. Clues to the origin of snake venom. New York Times November 22, 2005. Retrieved July 27, 2008. This page was last modified on 13 August 2008, at 12:41.